Bring your vacation to life and savor endless summers at Grand Cayman Marriott Beach Resort. Situated on the scenic Seven Mile Beach, this oceanfront hotel invites you to revel in relaxation while enjoying the sugary white sand and crystal clear water of the Cayman Islands. Whether you're snorkeling, paddle boarding or swimming in the beachfront pool, you'll find it easy to soak up the sun. Stingray City is also within reach, allowing you to make a splash with the friendly stingrays that the sandbar is known for. Spend an afternoon getting pampered at the spa, Botanika Union, then indulge in a mouthwatering meal and handcrafted cocktail from one of the stylish restaurants. From farm-to-table salads to seafood, you'll find everything you need to sip and savor to satisfaction. The upscale rooms and suites simplify your routines with luxurious bedding, plush robes and slippers, private balconies and room service. 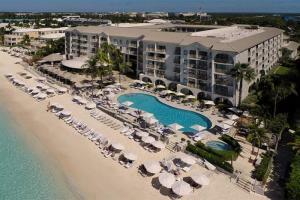 Grand Cayman Marriott is located just 4 Miles from Owen Roberts International Airport. Seven Mile Beach, Scuba, Snorkeling, Fishing, Red Sail Water Sports, Golf at the Links At Safehaven.